The Exercise Science bachelor's degree focuses on the science of human movement and its importance in maintaining or improving health, physical fitness and athletic performance. 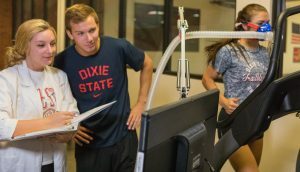 Coursework includes: Intro to Exercise Science, Anatomy, Physiology, Physiology of Exercise, Biomechanics, Motor Control/Learning, Measurement & Evaluation of Physical Exercise & Sports, Sport & Performance Psychology, Principals of Fitness and Lifestyle Management, as well as Nutrition for Sport and Exercise. *For a complete list of graduation requirements click here.